Meeting Report One of the major challenges facing South African medical providers and funders alike is the lack of impact the country's services is having on the prevalence and management of chronic disease. in real-life situations. There are excellent self-management programmes for people with chronic disease," Ball added, explaining that Medscheme staff once attended the Stanford Chronic Disease Self-Management programme and are now licensed trainers within South Africa. On "paying for volume and not value": If one looks at quality in multiple practices, the variation in quality is often greater within a practice than between practices. This means that essentially all practices do the right thing some of the time. 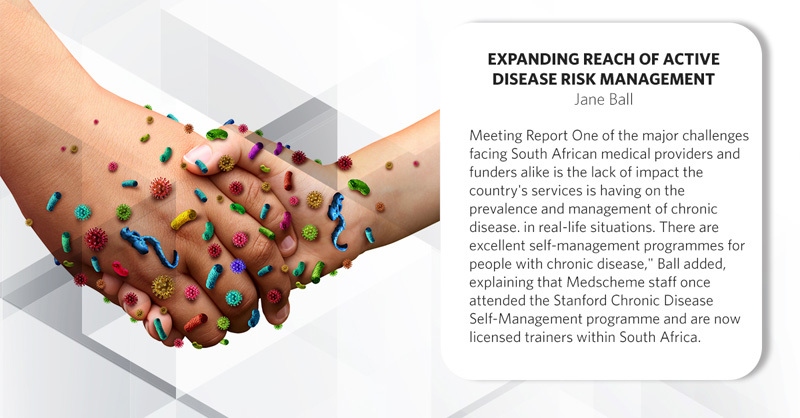 EXPANDING REACH OF ACTIVE DISEASE RISK MANAGEMENT Some of the reasons for this, Medscheme's Strategy Solutions GM, Jane Ball, suggested, could be attributed directly to shortcomings in the current delivery model. Examples given were rushed practitioners not adhering to best practice guidelines, lack of care coordination, lack of follow up, and importantly, patients inadequately coached for self-management will doing the same, but trying harder, work better or do we collaboratively need to change the system?' she asked. What had been shown to work, she noted, was patient adherence to treatment plans, greater coordination of care, use of clinical triggers to focus interventions it follow ups, and facilitating self-management. "Self-management is not telling the patient what to do (sharing of knowledge, but assisting the patient to develop problem solving skills and the ability to apply knowledge returning to current delivery practices, she made reference to the acute focus of the current reimbursement infrastructure being. "So the question is, how do you reduce inpractice variation to get practices to do the right thing most of the time?" Considerations by healthcare professionals in this regard, Ball ventured, included changing underlying structures to improve care coordination: "This will require healthcare professionals to change how they deliver care, such as adapting services to meet population needs." Also to be considered would be what their revised practice team should look like and then how the concept of self-management be incorporated. "There is no quick fix or magic bullet," Ball concluded. "A multidimensional solution is required for a complex problem. But together we need to start putting a solution into place....!"